Some loud-and-proud white supremacists are planning two “White Lives Matter” events in middle Tennessee. It’s always hard to tell whether some planned white-supremacist demonstration will wind up being canceled for lack of funds, interest, or courage. But it looks like tomorrow is a go for two self-styled “White Lives Matter” events in the middle Tennessee towns of Shelbyville and Murfreesboro. 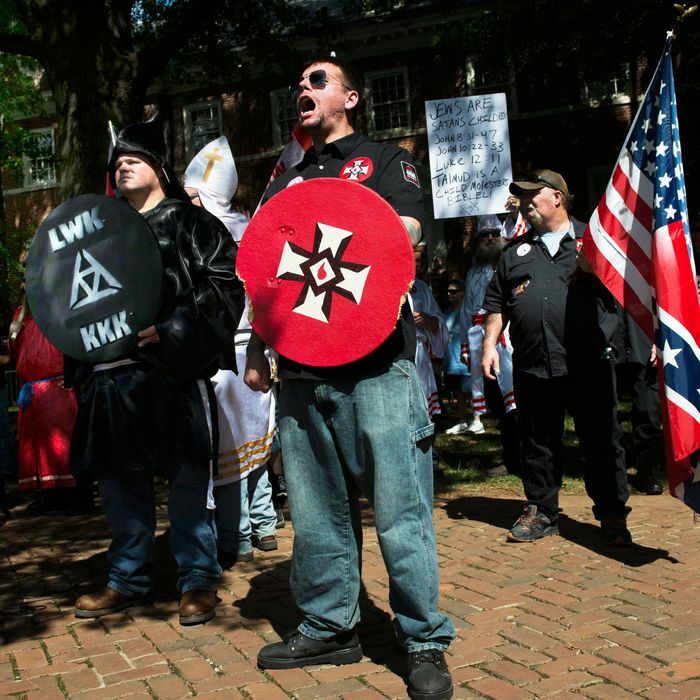 The official sponsor is the Nationalist Front, a coalition of white-supremacist groups that includes the League of the South (advocating a separate white southern “ethnostate”), the Traditionalist Workers Party (an anti-Semitic fascist group), and the National Socialist Movement (straightforward neo-Nazis). These groups all participated in Unite the Right rally in Charlottesville in August that led to violence, death, and some conflicted statements from the president of the United States. But it seems they will have less semi-respectable “cover” in the Tennessee actions. On the other hand, Spencer has apparently been invited to speak at the events. His media notoriety alone is too valuable to ignore. Why did these sketchy racists choose middle Tennessee for their latest provocations? For one thing, they perceive the area as less hostile to them as the famously progressive Charlottesville. “It makes sense for us to hold our events where our people actually are,” said one organizer. But more important, middle Tennessee has seen some significant demographic change as immigrants and refugees, some Latino and quite a few Muslims, have settled there. Shelbyville, a small city with about 20,000 residents, has absorbed several hundred Somalis brought in by the Office of Refugee Resettlement to work in local poultry processing plants. Murfreesboro, a larger city with a population of 131,000 and a regional state university, was the site of extended protests against the construction of a mosque (which finally opened in 2012). The subject roiled local Republican politics for years; local U.S. representative Diane Black (who is now running for governor) nearly got taken out in a primary for insufficient zeal against the mosque construction, though she did go out of her way to signal opposition to the phantom menace of Creeping Sharia. So there is plenty of raw material for white-supremacist exploitation, and the White Lives Matter organizers say that they expect local support due to opposition to demographic change. A more specific alleged objective for the rally is to convince President Trump to speak out about a September shooting at a church in nearby Nashville (killing one and injuring seven), in which the shooter was an immigrant from Sudan. The big question is whether the rallies will provoke violence in encounters with police or with counterprotesters. Shelbyville (where the first rally is planned for mid-morning) and Murfreesboro (where afternoon events are planned) are near enough to major cities that counterprotesters will almost certainly outnumber the visiting racists, perhaps by many multiples. And while rally organizers disclaim any violent intentions, they certainly do not hide their racist and fascist lights under a bushel. If they actually show up, it will be a tense and perhaps terrible day in middle Tennessee.